For the Castle, see Katzenelnbogen. For the Surname, see Katzenellenbogen. The County of Katzenelnbogen (named after Chatti Melibokus ) was an immediate state of the Holy Roman Empire. Chatti Melibokus is a very old tribe who stayed on a high hill in the Bergstraße region of Hesse (the part that lies south), in Germany. It existed between 1095 and 1479, when it was inherited by the Landgraves of Hesse. The Chatti were an ancient Germanic tribe whose homeland was near the upper Weser. They lived in central and northern Hesse and southern Lower Saxony, along the upper reaches of that river and in the valleys and mountains of the Eder and Fulda regions, a district approximately corresponding to Hesse-Kassel, though probably somewhat more extensive. They settled within the region in the first century B.C. 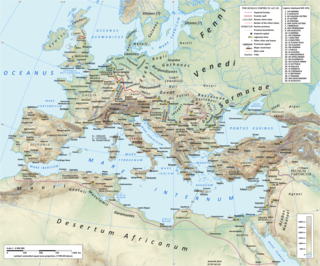 According to Tacitus, the Batavians and Cananefates of his time, tribes living within the empire, were descended from part of the Chatti, who left their homeland after an internal quarrel drove them out, to take up new lands at the mouth of the Rhine. The Melibokus is at 517 metres (1696 feet), the highest hill in the Bergstraße region of southern Hesse, central Germany. It was also the name of a hill in Germania described by classical sources. But the two are probably not the same. Katzenelnbogen is the name of a castle and small town in the district of Rhein-Lahn-Kreis in Rhineland-Palatinate, Germany. Katzenelnbogen is the seat of the Verbandsgemeinde Katzenelnbogen. One Diether I (circa 1065–95) of Katzenelnbogen (literally cat's elbow), then serving as Vogt of Prüm Abbey, was first mentioned about 1070 in a deed issued by Archbishop Anno II of Cologne. From 1094 onwards, Diether and his son Henry I built Katzenelnbogen Castle in the Taunus mountain range; in 1138, King Conrad III of Germany vested his grandson Henry II with the comital title, when the Kraichgau was bequeathed to him. The counts also built Burg Rheinfels and Auerbach Castle in the 13th century and finished Burg Katz in 1371, they rebuilt the Marksburg purchased from the Lords of Eppstein and acquired highly lucrative customs rights on the Rhine River. Over nearly four centuries, the county grew bit by bit, from the Neckar to the Moselle Rivers. A Vogt in the Holy Roman Empire was a title of a reeve or advocate, an overlord exerting guardianship or military protection as well as secular justice over a certain territory. The territory or area of responsibility of a Vogt is called a Vogtei. The term also denotes a mayor of a village. 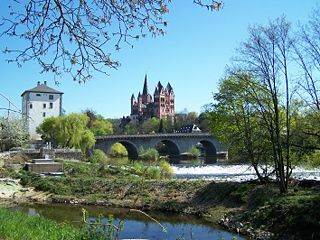 Prüm Abbey is a former Benedictine abbey in Prüm, Lorraine, now in the diocese of Trier (Germany), founded by the Frankish widow Bertrada the elder and her son Charibert, Count of Laon, on 23 June 720. The first abbot was Angloardus. The Taunus is a mountain range in Hesse, Germany located north of Frankfurt. The tallest peak in the range is Großer Feldberg at 878 m; other notable peaks are Kleiner Feldberg and Altkönig. Berthold II of Katzenelnbogen became a leader in the Kingdom of Thessalonica in the first decades of the 13th century. Diez an der Lahn is a town in Germany's Rhein-Lahn district in Rhineland-Palatinate, on the borders of Hesse. Diez is the administrative seat of the municipality of Diez. Limburg an der Lahn is the district seat of Limburg-Weilburg in Hesse, Germany. With the formation of the Confederation of the Rhine in 1806, the County of Katzenelnbogen was annexed to the French Empire as the first of its trans-Rhine territories, and this was held until the overthrow of Emperor Napoleon I in 1814. The territory was attached to the Duchy of Nassau by the Congress of Vienna in 1815. William III of England a Prince of Orange had the title Katzenelnbogen in his reign from 1689-1702 and today, both the Grand Duke of Luxembourg and the King of the Netherlands have the title "Count of Katzenelnbogen" as part of their style. The county was divided in 1260 and ruled by two lines of counts. Eberhard IV was succeeded by Diether VIII, reuniting the junior branch. The whole county was reunited in 1402 by Johann IV, son of Diether VIII, who had married his cousin Anna, daughter and heiress of Eberhard V, in 1385. Anna married Henry III, Landgrave of Upper Hesse, and the county passed to the House of Hesse. Henry I of Hesse "the Child" was the first Landgrave of Hesse. He was the son of Henry II, Duke of Brabant and Sophie of Thuringia. Zwingenberg lies in the Bergstraße district in southern Hesse, Germany, south of Frankfurt and Darmstadt, and with the granting of town rights coming in 1274 it is the oldest town on the Hessian Bergstraße. Sankt Goar is a town on the west bank of the Middle Rhine in the Rhein-Hunsrück-Kreis (district) in Rhineland-Palatinate, Germany. It belongs to the Verbandsgemeinde of Sankt Goar-Oberwesel, whose seat is in the town of Oberwesel. Auerbach Castle is one of several fortresses along the Bergstrasse in southern Hesse, Germany. The castle was originally built by King Charlemagne and rebuilt by Count Diether IV of the Katzenelnbogen dynasty in the second quarter of the 13th century. Today it remains standing atop a hill known as Urberg above the town of Bensheim-Auerbach. Leiningen is the name of an old German noble family whose lands lay principally in Alsace, Lorraine and the Palatinate. Various branches of this family developed over the centuries and ruled counties with Imperial immediacy. Philip II of Hesse-Rheinfels, also called Philip the Younger, was the first Landgrave of Hesse-Rheinfels. Henriette was Sovereign Countess of Montbéliard from 1397 until 1444. Henry III, Landgrave of Upper Hesse, called "the Rich" was the second son of Louis I of Hesse and his wife Anna of Saxony. Johann Reinhard III of Hanau-Lichtenberg was the last of the counts of Hanau-Lichtenberg. He reigned from 1680 to 1736. From 1712 to 1736, he also reigned the County of Hanau-Münzenberg. Ottilie of Katzenelnbogen, was by marriage Margravine of Baden-Baden. Philipp I of Katzenelnbogen (1402–1479), also known "Philipp the Elder" was Count of Katzenelnbogen from 1444 to 1479 and was the last male descendant of the Counts of Katzenelnbogen. His parents were Johann IV, Count of Katzenelnbogen and Anne of Katzenelnbogen, who merged the two lines of the family back together in 1402. Johann IV, Count of Katzenelnbogen was one of the last members of the younger line of the Hessian House of Katzenelnbogen. He ruled the reunited County of Katzenelnbogen. Rupert, Count of Nassau-Sonnenberg, nicknamed the Bellicose, was a son of Gerlach I, Count of Nassau and his second wife, Irmgard of Hohenlohe. Philip III of Falkenstein, Lord of Falkenstein, Münzenberg and Lich was a member of the Lich line of the Falkenstein dynasty, son of Werner I of Falkenstein, Lord of Münzenberg and Falkenstein, who founded the Lich line, and his wife Mechtild of Diez. ↑ "Chatti" . Retrieved 21 December 2018. ↑ "Melibocus" . Retrieved 21 December 2018.